HERE is my pancake recipe if you prefer to make your own. Have 3 inches of oil hot and ready. Drop a bit of batter in and see if it drops then floats and bubbles up. 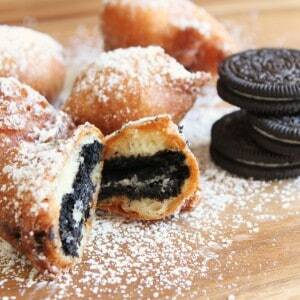 If it's not hot enough the Fried Oreos will be greasy. When your oil is hot enough dip each Oreo in batter and then into the oil, flip each Oreo over so they are golden on both sides. It will only take a couple minutes until they are cooked. Strain on a tray with paper towels, then dust with powdered sugar while they are still hot. Let cool a minute or two before eating.